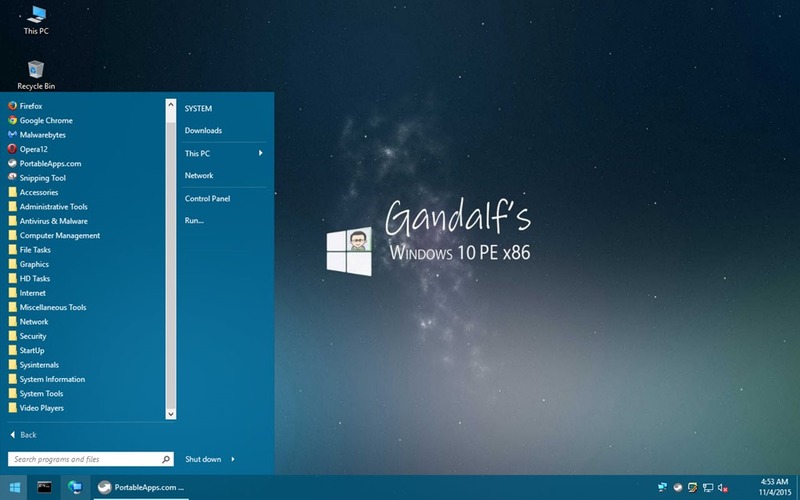 This is is the my second release of a Windows 10 x86 PE. Dotnet 2-4 is included in this build. Also there is a wider range of apps (listed below) included as well. MalewareBytes Famed malware- killing machine Dism Gui This app enters those hard to remember dism commands for you. Some shortcuts in the Start menu will not work since I removed these licensed versions of the app for my personal use. Thanks for your efforts in making this Boot Disk. Appreciate a lot. I will download and give it a try. Thanks for this! I want to use this as a data recovery platform, but AutoChk chews on at-risk drives, which is deadly in this context. How can I add the registry setting to disable AutoChk, and ideally prevent other post-Win8 fiddling with whatever it finds on hard drives when it starts up? Currently, my only safe option for GPT Win8+ drives has been WinPE 3.0 and XCopy, as this is based on the Windows 7 code base; able to read GPT but too old to try and boot it or fiddle with the Win8+ bootability aspects of it. My skills were strongest in the Bart PE era, so I’m not so hot on WinPE, USB booting, and weakest on troubleshooting GPT boot failures. 1) Any chance of a Win10 PE 64-bit with WoW support for 32-bit apps? …as I see no likely candidates in Users, nor ProgramData? As for the hive you edit, that depends on the build. I will hopefully post instructions on how to do that soon. Strange, and I see what you mean… when I first hit the site I downloaded what I thought was 64 with WoW, and indeed it is – but while commenting etc. the pages looked more like (x86) so that was what I thought I’d downloaded and why I asked about a 64+WoW. As to hives, I can find the system stuff OK, but the only NTUser.dat I can find is the one in Default. If PE works as a pseudo-install process, perhaps it spawns the user account from this at runtime? I also discovered WinTools in the 10 PE’s PortableApps, and it looks like that may make the build editing process a lot easier. The site’s Tutorials are good for info on what registry edit corresponds to what UI settings adjustments. I’d recommend posting the hashes for your ISO images on your website instead of the same repository as the image itself. If someone can compromise the image repository, it would be also trivial to change the hashes. Just a security observation and I know I’d feel better using the images with this verification change. Great work otherwise. I changed the wallpaper, and now my taskbar and windows are a hideous vomit green color. 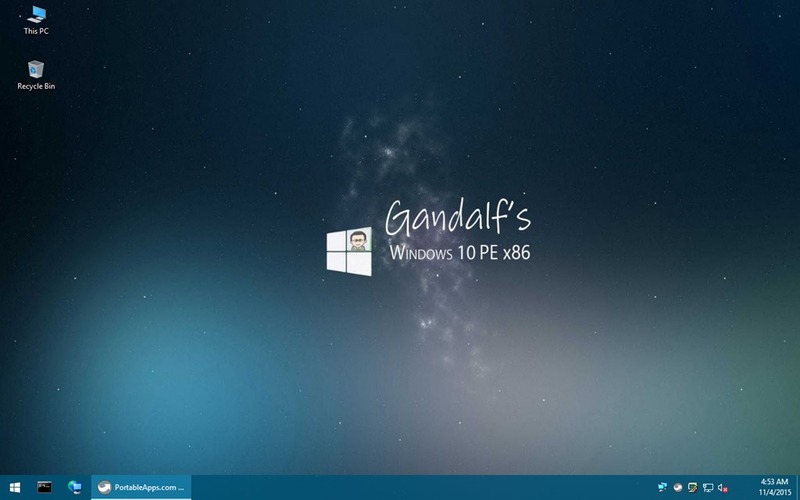 Do you know if I made a theme in Win10, then copied it to Gandalf. Will it work? Thanks. Great job. Works with YUMI. Hi,,thank you for sharing this fantastic recovery disc, now dumb question time, would ot be possible to make this iso/wim a boot option under a UEFI boot menu? this would be SO handy as a recovery tool when/if windows becomes unbootable,gets a major virus,etc. Hi. I am using your Win 7 PE x86. I really appreciate your masterpiece work. Why Win 10 PE x86 doesn’t include any partition manage program? I often use partition manager in Win 7 PE x86 so satisfactorily that can’t go over to Win 10 PE x86. I will be adding one soon. This is how I got this to boot on my UEFI, Unbranded UN-15MS10 tablet to be exact. I used Rufus 2.6.818 to write this to my USB stick. After selecting the iso image, change “Partition scheme and target system type” too “MBR partition scheme for UEFI,” and change “File system” too “FAT32,” then write the image to the USB stick. Put the USB stick into the device, and pressed F12 to enter my UEFI, and selected the USB stick under “Boot Override.” It then booted right into this PE. I hope that this helps anyone else that has trouble getting this to work with UEFI. What a better way to ring in the new year : than to download your latest offering. Much appreciated & a happy new year 2016 to you & your loved ones. One info missed. Is this live distribution or is this installable? Hi Gandalf, thanks for the excellent work. I wanted to load the update Version 2015/11/05 however the download stops from OneDrive allways just before completion at about 90/95%. Any chance to get the BOOT.WIM from this ISO-Version seperately or can you please check the OneDrive-File? I loaded the 1st version without portable Apps which was OK, but I prefer to have the PortableApps-Version for better customization. Annother Question: How can I change the keyboard to German? There is a timelimit of 2 hours loading from Onedrive and the download stops automatically thereafter. I’am at the moment in Spain and I have only a 1800 to 2.000 ADSL connection, but I would need a download time of about 2:20 hours – 20 minutes more bevor OneDrive stops the download automatically. Is there a possibility to extend this restriction to e.g. 2.5 hours? I resolved the problem today. I visited a public internet shop and downloaded the ISO there. Returning home I checked the downloaded with my bigest – but not completed – download and the difference was only 12 MB are missing which means, that I was assuming, that there is a timelimit. Memory leak? Affecting Intel graphics only, or more generic? These sorts of problems are tough to tshoot; my guess would be something integrated into the booted PE OS, e.g. 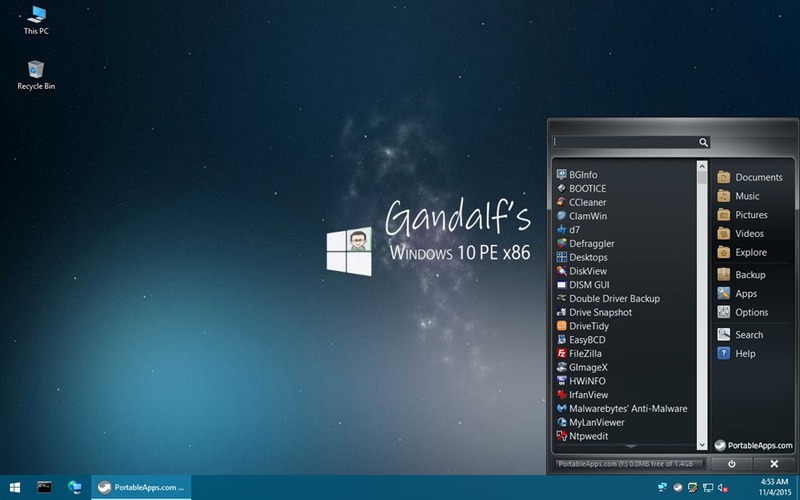 drivers, Start Menu and other shell enhancements, and shell integrations such as WinRAR. It “feels” like a scalability-driven memory leak, and as it affects bulk file ops, I’d suspect shell integrations. That Acronis may be a “smoking gun” if deeply integrated (as a “device driver”) and fiddling with files and archives underfoot. Which file kicks off start.exe on drive Y:\? I wanted to edit it to also launch other portable apps at startup. But none of the config files in Windows/System32 that I can see have start.exe listed in them. Can you point me to the file? Hi, can you please add new mirrors or update the existing ones? OneDrive no longer has the file, apparently, and Mega is a douche that doesn’t allow you to download more than 700MB without upgrading to a premium account. Mega doesn’t limit anything on my computer. can you add me to Onedrive ? THX very much, good job! Hello there, can you please add me for the onedrive download?